St. Peter's Church, Carmarthen, has undergone extensive refurbishment of the chancel and consistory court floors. The existing floors were subsiding which eventually led to the removal of the organ (originally constructed for St. George's Chapel, Windsor Castle) for safety reasons. 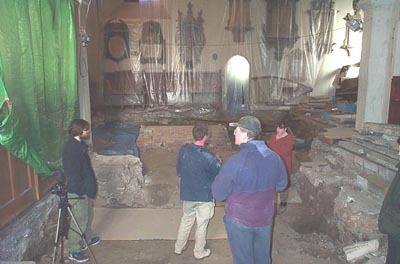 As part of the floor replacement scheme the chancel and consistory court were partially excavated. The church is located just inside the site of the west gate of the former Roman town of (Moridunum) and Roman deposits were encountered during the excavation. The construction of a series of brick vaulted tombs during the 18th and 19th century had heavily disturbed the earlier deposits, although a few intact 17th century burials were noted. A number of grave slabs and markers that made up an early to mid 19th century floor were also recorded. Most of the slabs had been recorded during the early 19th century, although one or two were previously unknown. The brick built tombs were family vaults containing many coffins. One interesting find was a lead box that supposedly contains the head of Sir Richard Steele (born 1672 - died 1729) founder of the Tatler magazine and essayist for other well-known publications such as the Spectator. Post-excavation is currently underway and research is being undertaken into the identities of the families in the tombs and also those commemorated on the grave slabs.